David's enjoying the new Invezo Stunt Drone from Revolution, a new hobby-shop-only brand from Horizon Hobby. 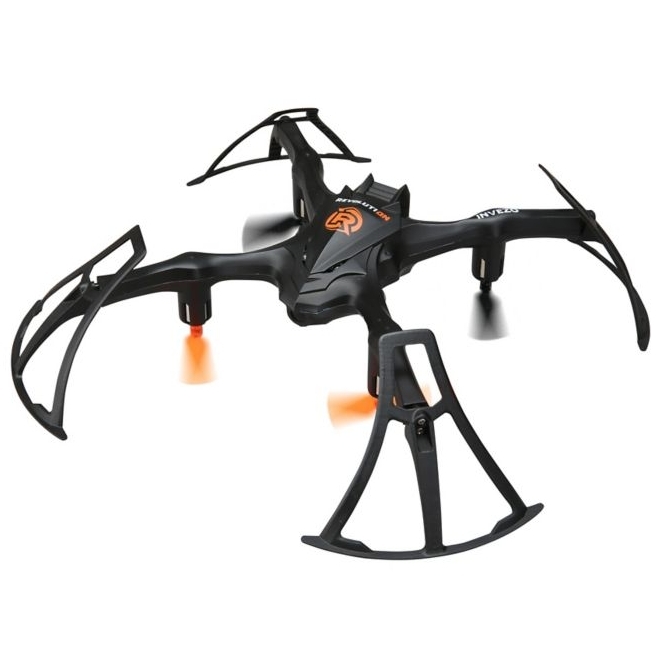 The Revolution Invezo Stunt Drone is easy to fly, even if it's your first time. The unique airframe design is durable and helps to protect the rotors from most impacts and crashes. It's small enough to fly almost anywhere indoors, but isn't hard to see or fly like some smaller "micro" drones. Built-in color LED lights vividly display aircraft attitude and orientation, especially in low light conditions or when you're flying upside down. Once you've mastered the basics of drone flight, the Invezo can take your skills to a higher level. Three different control mode options let you change the rate of agility at the press of a button. Fly slow and smooth or as fast and aggressive as you like. You can also flip upside down to fly inverted or perform full aerial flips at the press of a button. Invezo makes learning to fly a drone and perform stunts easy. Learn the basics of flight in the Easy control mode, and at the press of a button you can increase the Invezo Stunt Drone's agility with the Pro or 3D control rates. You can also perform full 360° flips or 180° half flips to fly inverted. Upright or inverted, Invezo is easy to fly either way. The Invezo comes out of the box completely assembled, test flown and ready to fly. Also in the box is everything you need including AAA batteries for the 2.4GHz transmitter. The rechargeable LiPo battery delivers long flight times and the included charger works from almost any computer or USB power source. Even a spare set of rotor blades is provided. That means there's nothing extra to buy and you can be ready to fly within minutes of opening the box. The Invezo runs only $44.99 and is in stock now!